There’s so much we don’t know about Mary Bowser. We only have a scant portrait of her early life, but we know that she was baptized in 1846 and was a slave in the home of John Van Lew in Richmond, Virginia. After his death, Van Lew’s wife and daughter Elizabeth freed Mary and the family’s other slaves. That’s where the story that we know begins. As the Civil War began in 1861, Bowser — then married and living outside Richmond — was still corresponding with Elizabeth, whose quirky personality and pro-Union politics had earned her the local nickname “Crazy Bet.” Bowser began carrying information to Elizabeth from the Confederate White House in Richmond, providing a vital link in the spy network that Elizabeth would build over the course of the war. Now, Bowser reappears in “My Heart Like a Needle Ever True Turns to the Maid of Ebon Hue,” a new poem by Anaïs Duplan. Duplan was born in Haiti, where she said Creole dominates everyday life and French is a marker of the upper class. This impact of French colonialism on language left her with specific ideas about what constituted a “good” poem, she said. But in writing Bowser’s story, she realized she didn’t need to couch the meaning of her words. “Whatever I have to say, I mean to say in the way that I feel it, even if I’m afraid of not being heard because of how I’ve said it,” she said. Duplan said she wanted to examine what it means to conflate this historical moment with the archetype of a male religious figure. “What does it mean to make Mary Bowser into a holy man?” she said. You can read the poem, or hear Duplan read it, below. lllllllllllin leather church shoes, in wrinkled-up sun hats. lllllllllllwhite bellied Buddha in luxurious blackface. llllllllllland came back in the morning as a TV reporter. lllllllllllheld up his arms and prayed a massive prayer for us all. lllllllllllBowser’s armpit and let out a most deflated cry. lllllllllllby the palm fronds in the corner of the Enterprise office. like two strange fruits in winter. 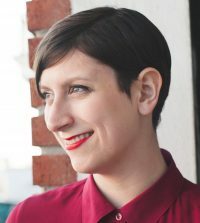 Anaïs Duplan is the author of Take This Stallion (Brooklyn Arts Press). Her poems and essays have appeared in Hyperallergic, Boston Review, The Journal, [PANK], and other publications. 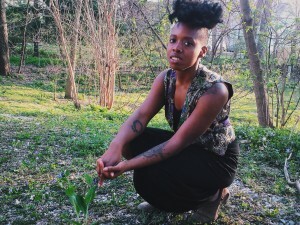 She is the director of the Center for Afrofuturist Studies, an artist residency program for new media artists of color. She lives in Iowa City, where she is an MFA candidate at the Iowa Writers’ Workshop. This poem was originally published in the Summer 2016 issue of The Journal.